The guys over at Menlo Park are set to roll out “A Simpler Way to Organize and Optimize Campaigns on Facebook” on March 4th. We answer the most important questions many advertisers will be asking. From the infographic below and the official Facebook news release, yes they are – Hallelujah! “You can create multiple ads within each ad set, making sure each ad is targeted to the same audience while delivering different images, links, video or ad copy”. 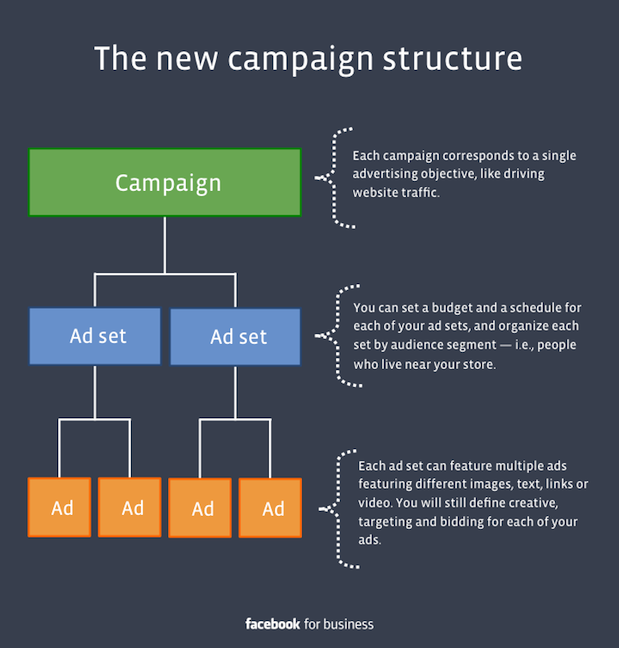 Previously a Facebook ad campaign would only have two levels: campaigns and ads. Now they’re going to add another level called Ad Sets. Much like the Google AdWords “Ad Group Level”, advertisers will be able to have multiple ads within Ad Sets. The infographic below explains it quite nicely. The new update will help advertisers with campaign planning and optimization and most importantly types of content they can advertise with. Will my current campaign be affected? Nope, the post states that all accounts will be migrated automatically and it won’t impact your advertising account.